in the Seventies when he was the drummer for local Maidstone band, Music Familiar. That said, Buen Chico has a modern sound but has dipped into music history to form the best of both worlds. The publicity machine says: "…the name they have chosen pithily re-veals these two sides of their coin plus a dash of their amiable geek-iness: Buen Chico's is the sound of being born in the last few years of the 1980s, then growing up in the 1990's with your eyes open; the songs are conditioned with a set of political sensibilities that feel timely and from the gut, as opposed to the contrived posturing of some of the world's more grandiose recording artistes. From the anti-lethargy indie rock mantra of their debut single Giving Your Gifts to the classic punk-indie-ska treatise of Laying Down the Law, sarcastically des-cribing the hypocrisy of politicians: "What can we use this chair for/if we don't kill those who've killed before?" of Drip Drip Tick Tock, proclaiming as it does that "Water's running through my house/I'm never gonna bail it out/I know this sounds dire/ But I can always build one higher." The flagship single Choosing My Religion that came out on 8 October (2007) is a scenic tour of everything good about the band with their seemingly bottomless well of ideas and all those clever turns of phrase  and Buen Chico have pulled out the stops for Right To Re-Arrange. brings a glorious drama to it all and Alan Kenworthy (drums/percussion) under-writes it all with pithy, coruscating drum licks. Playlouder, while intro-ducing an interview earlier this year, said: "They [Buen Chico] have the solution to world peace". and it was originally taken from George Orwell's Spanish Civil War memoir Homage to Catalonia. Having picked up the momentum that has already given them an im-pressive portfolio of support slots  including joining The Long Blondes, Kaiser Chiefs, The Subways, iForward, Russia!, GoodShoes and The Cribs  Buen Chico are single-minded about fulfilling their musical am-bitions. And no doubt, fulfil them they will. 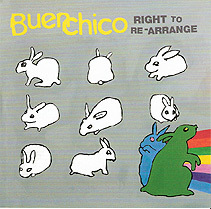  Buen Chico's CD album Right to Re-Arrange was released on 15 October (2007).